I have another criteria on handgun choices, how much do magazines and grips and other accessories cost ? The thing I love about the 1911 is that there are so many choices for anything you need think you need or just plain want. I am getting to the point that I do not want to spend $ 40 for a magazine ! that is what some manufacturers are charging for their magazines and I feel as I was being robbed. That's a very valid point. But, for the 1911 especially, there are so many choices out there. Some are great and some are horrible. That's part of the reason I love this forum. With all the years of experience present here, reading the posts has helped me make good decisions about my firearms purchases. I spent a long time trying out all types of doo hickeys and doo dads on various types of 1911's and decided a 1911 is not a pizza to keep loading more gee gaws on. I love a bone stock 1911 with the tiny sights, and no improvements. Interesting point, but it wouldn't deter me from buying the handgun I really want. Even if the mags cost $35-40, you buy a couple extra (gun should come with two) and you're pretty much fixed. And grips, well, a really nice self defense handgun should already have good grips. And if not, we're talking maybe what, 60 bucks unless it's an exotic material, which puts it into the "fancy stuff" category and really doesn't have a lot to do with a self defense weapon. Accessories the same -- laser or flashlight costs the same, regardless of what gun you buy, right? Your missing the point, it was not your criteria, you make up your mind and that is that. As the original poster, I stated that from now on, I am going to use a measure of what handgun I choose, instead of a proprietary model where you have to buy from the manufacturer because everything is unique to that gun, and if it is chambered for pricey ammo, even worse. The idea is if I can choose a model that has either common parts as a 1911, or lots of aftermarket parts, (Glock) that tends to keep OEM parts cheaper too. "And grips, well, a really nice self defense handgun should already have good grips." I have always tried different grips to see what worked best for Me, regardless of what grips the gun came with. I have spent years either modifying firearms or building them to suit "My needs", so nothing is moot when it comes to what I see as my needs. What's a moot and how many points do they have? I have a different take on it all togethor. If you are going to knit pick the price of a $40 to $50 magazine cost maybe you should take up another hobby instead. Check into Netflix or playing cards. Ah, understood. Myself, I've never bought "special" handguns anyway, lucky to be mostly interested in the standard types, like 1911s and Glocks and such. And yes, some folks who work on guns as part of the enjoyment of them (whom I might call "hobbyists" -- no negatives here, just a category) spend time, say, building an AR and then turn around and start building another one. Building or working on guns just isn't part of my interest in them, personally -- I just like shooting them. And I really don't buy a lot of guns, so I take my time evaluating the purchase and save up, then spend the bucks on what I really want. So for me, there's not much modifying aftermarket, if any. For example, my newest, the Springfield 1911 "Operator" lightweight is excellent -- good grips, shoots fine, nice looking classy design. Frontstrap checkering is the only thing I'm considering, in which case yes, it'll cost me some bucks to send to the factory and so on. But yeah, I understand -- I'm not gonna put out dough for a firearm that's so "special" that accessories or magazines are too pricey. But the thread title is "personal defense handgun" (a specific category) which limits the purpose and type of gun, which also, as I see it, limits the amount of money you'll be shelling out for accessories or magazines, etc. So Doc, are you including all guns you've worked on or owned and not focusing on the self defense gun itself? I have to re-build or modify a handgun a lot for personal defense, maybe I've picked the wrong gun in the first place. Depends on the type of moot. There are regular moots, rogue moots, rouge moots, and rogue rouge moots (the most rare, giving you 14 points each). Self defense is not a hobby. It is a necessity. Take fire extinguishers for example. Most of us will say if it gets the job done, why bother with a special $50 wall mount? I believe that Karl is looking at the utilitarian aspect of firearms as opposed to the hobby. Now if tricked out fire extinguishers are your thing, more power to you, but it probably is not going to affect it's ability to put out a fire. Well. . .grips are pretty much a one-time expense. They're gonna cost what they're gonna cost, and material is probably a bigger determining factor than weapon type. Extinct mastodon ivory will cost you more than injection-molded rubber, but once they're bought, you're done. Upgrades to sights will be more a matter of availability for type than cost-per-set. Same for holsters. When you get to the topic of magazines, EXCEPT for the 1911, there's usually factory/OEM magazines that cost $20 and up, and then there's aftermarket crap. There are some exceptions like Metalform and Mec-Gar (who make a lot of OEM magazines), but generally, $10-$20 gun show magazines are something to avoid. Then there is the matter of how many you want/need. . . But your point is well taken - one more reason why the two categories of handgun are "1911" and "Other". Man that's about the rudest crap I've seen from a new guy yet.Pal your in the wrong place. That was funny, hobby ? Ha Ha !!! The thing is, I have a Bersa MiniFirestorm, I love it because it is one of the better shooting compact .45 acp pistols I have had to date, even though I do not really care for pocket carry persay, I can drop it in My pocket and forget it is there, it ejects spent brass so vigorously as to lose it. Even though it has an aluminum frame, felt recoil is not at all bad, so it groups rather well. I however hate paying $40 per magazine, way too much. Sorry, Doctorwho, didn't mean to be so hard on you. Iam not new here. Been here for many years now. As a side note, for years I was spoiled, if I needed stuff like ammo or magazines, (standard issue stuff) all I had to do was pull it off a shelf, now that I actually have to pay for stuff (read expensive) I do not like to pay two to three times as much for proprietary stuff, as compared to compatible parts etc. never liked that with tools either. Springfield XD-45 or XDm-45. Springfield brand 13-rd magazines $25 from Midway USA. 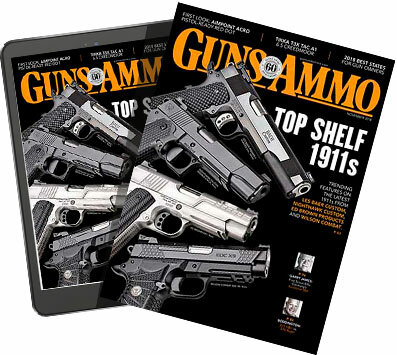 Of course, the ultimate magazine bargain is Guns and Ammo 2-year subscription! Agreed. The point I was trying to make earlier is that if I really like a self defense handgun (subject of this thread), I'm probably going to buy more than 2 extra mags for it anyway, for a total of 3-4, including what came with the pistol. So if the price is 40 bucks, hey, it's not like something I buy every few months, instead just a single "start up" purchase. The thing is, Personal Defense and even target shooting has never been a hobby with Me, it has always been a serious endeavor for which there is no substitute, it is not just a way to spend time. And yes, sometimes you have to bite the bullet, (pun intended) and pay more for stuff, I however will only do so if I have not other choice in the matter. Works for me. No foul, no harm. Even though he misspelled "nitpick", I think Chuck was trying to be humorously sarcastic with his "hobby" comment and didn't intend it to be mean spirited. Just a word in defense of someone who's only doing stuff that I have done in the past -- pick nits and post sarcastic comments (who, me, little ol' samzhere? ha ha)[/QUOTE First of all yes, I was Chuck14 in a previous life. I have been on this board for many years and most of you ( not all) have been very helpful and kind to me. That is why I made a second post to DoctorWho and appoligized (misspelled) to him. I guess I have just been fortunate in life and not had to worry about the price of a magazine. But regardless of that I did tell DoctorWho I was sorry and I mean it. Hopefully we can close the case on it now.